The vet is driving as fast as she can to the scene of an urgent emergency: a Hanoverian foal has been injured! She examines the animal with the mobile X-ray machine that she transported in the car's spacious boot. To make sure the foal gets better again quickly, she gives it an injection with medicine from her medical bag and then records her diagnosis on her laptop. The roof and side wall can be folded open for optimum playability! 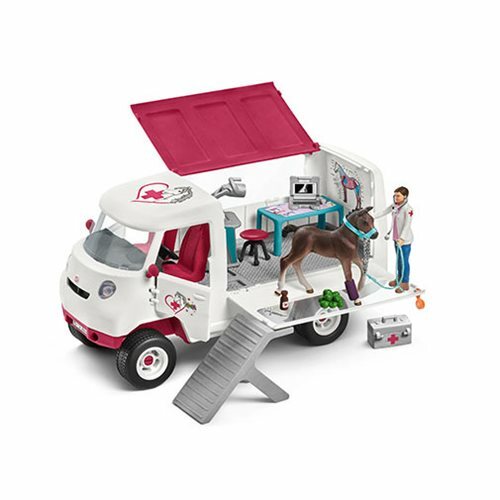 For more added fun, the Horse Club Horse Box can be attached to the mobile vet's car for more adventures (sold separately). The vet has movable arms and can hold individual accessories, sit or stand! The Schleich figurines are all modelled in finest detail and encourage children to play and learn at the same time. Playset features 1 x car, 1 x vet , 1 x Hanoverian foal, 1 x medical bag, 1 x stethoscope, 1 x syringe, 1 x medicine bottle , 1 x laptop, 1 x X-ray machine, 1 x bandage, purple , 1 x halter , 1 x apple, green , 1 x table, 1 x chair, 1 x prescription pad , 1 x plasters sticker sheet, 1 x sticker sheet, 1 x assembly instructions. Measures 11 3/4-inches long x 9-inches tall.